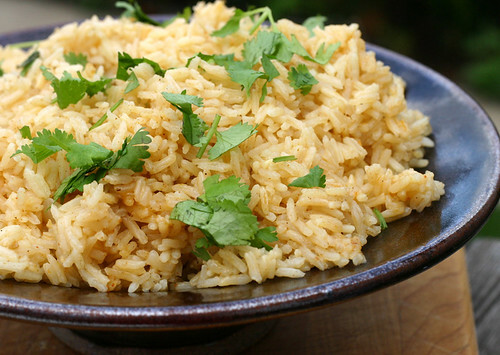 Mexi Rice for a Fiesta! Today we had our yearly Mexican Fiesta but this time it’s also for the Monthly Mingle:Mexican Fiesta from the host food blog All Things Edible. So for that we made my all time favorite Mexi Rice!!! I have had this rice ever since I first came to Mary’s house which was about five years ago (when I was only five) and we have had it every year since. Now that I am old enough to make it I made it for you with a little help from Mary!!! When we make it I just want to eat the whole thing!!! But when we make the Mexi Rice we have it with Mary’s fantastic fajitas on the grill!!! It was an amazing and filling dinner!!! 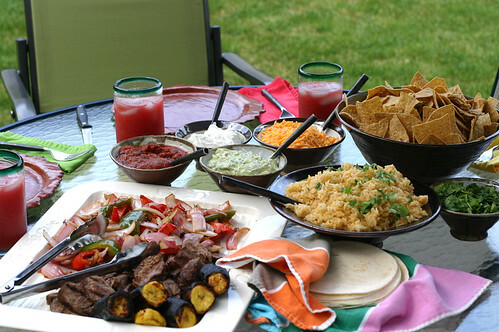 Besides the Fajitas with all the fixings we had Grilled Plantains Watermelon Coolers and homemade Guacamole. To start get a pretty good sized sauce pan. 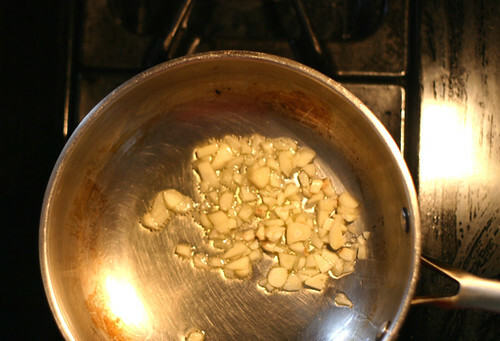 Then put olive oil in the bottom of the pan and turn on the burner to medium. 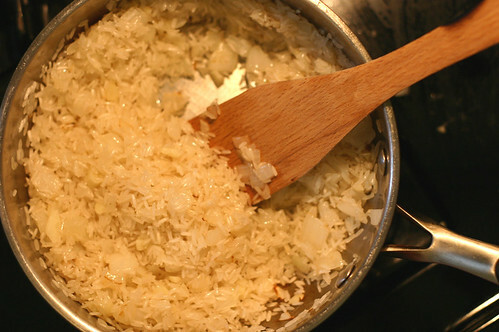 Now take about three cloves of garlic sliced and put them in your pan. 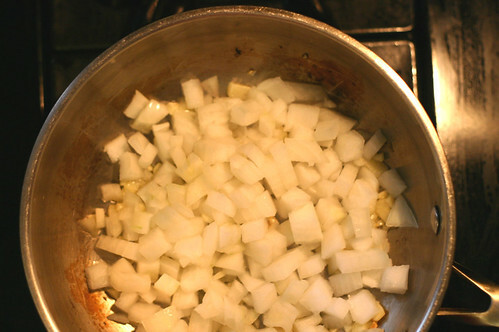 Take 1/2 of a cup of diced onion. 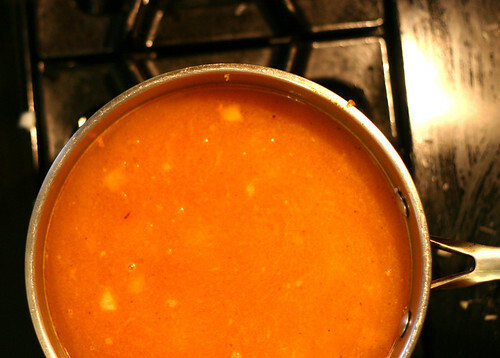 Put that into your pan and stir every once and a while until limp or slightly brown. Then put 1 1/2 cups of Jasmine Rice (I’ve tried other rice and only Jasmine Rice works) in your pan and pearl your rice. Pearl means the rice will turn a pearl color before it starts to brown. Add more oil if all the rice doesn’t get coated when you stir. 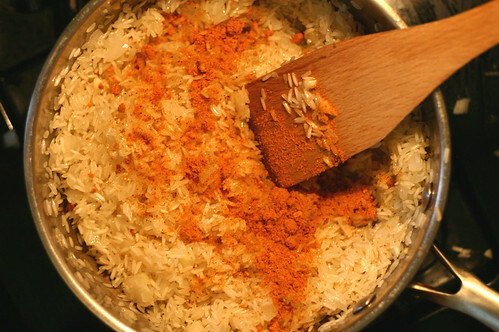 Put 1 Tbsp of Taco Seasoning and stir that into your rice. The finishing touch is to add 2 1/2 cups of chicken broth into the rice and put a lid on your pan and let it simmer on medium for about 15 min. Let the rice sit a few minutes after the broth is soaked up with the burner off. Then eat all you want!!! What a great Fiesta!! Ole!! Makes me hungry for Mexican right now! That rice sounds tasty! We’ll be trying that one soon! Beautiful table! Everything looks soo appetizing and delicious. My kind of fiesta! Great post! What a gorgeous table spread.. and the photo looks like it could grace the cover of any house and garden magazine! This rice looks really good, but it is definitely not authentic. I still would like to try it one day. Congrats on the top 9! Your pics are superb. What a great party filled with tons of amazing food! The rice is delicious! Thanks for a great recipe! and thank YOU for coming back and letting us know!